Hamilton’s LRT is back on track after the province vowed to lift a funding freeze on land purchases for the $1-billion transit line. But the city should look elsewhere for extra cash if light rail transit construction goes overbudget, said Progressive Conservative Transportation Minister Jeff Yurek. Yurek confirmed the city’s light rail transit project is “good to go forward” following a 20-minute private meeting with Mayor Fred Eisenberger at City Hall on Thursday. “Premier (Doug) Ford has committed the billion dollars to this project and it’s going to be wonderful for the city of Hamilton,” he said. The commitment ends months of uncertainty for a contentious project announced by the provincial Liberals but stalled by the recently elected PC government, which froze land purchases last summer and suggested city council could use the $1 billion in funding for other priorities. Speculation about the fate of the project was further fuelled by the province’s vow to cut a reported $13.5-billion budget deficit and the recently announced shrinking of a planned Mississauga LRT route to save money. 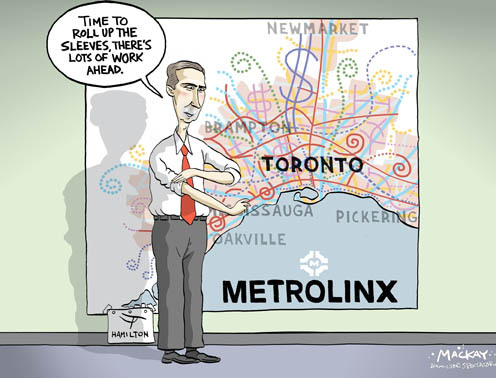 Yurek confirmed Thursday that Metrolinx could begin buying land again along the Main-King corridor, and that he is granting three consortiums an extra six months to complete bids to construct and run the 14-kilometre line from McMaster University to Eastgate Mall. Fred Eisenberger handily won the so-called “LRT referendum” election to become the city’s first repeat mayor since amalgamation. But it is still unclear whether his signature project, a controversial $1-billion light rail transit line, will survive the election of a council that remains badly divided over LRT. The veteran politician, 66, fought off a surprising challenge from Vito Sgro, a behind-the-scenes Liberal organizer who was not well known but ran a well-organized “Stop the Train” campaign hinging on the use of LRT cash for other infrastructure. “I see that as a mandate for us to move forward on LRT,” he said to a huge cheer from supporters squeezed into the room. It’s possible the fraught debate helped push up voter turnout in 2018 to an unofficial 38 per cent — not fantastic, but an improvement from last election’s dismal showing of around 34 per cent. The LRT is backed by an unprecedented coalition of politicians, businesses, developers, education and health institutions, unions and anti-poverty groups. As with most elections it’s never easy to fully prepare the perfect cartoon for the end result. Less complicated about the 2018 Mayoral election, compared with previous campaigns, was the fact that it was a two person race among a full slate of fringe candidates. Yesterday, I drew up three scenarios, all involving the proposed LRT. Full disclosure, two of the versions were revisions of cartoons drawn for the 2014 municipal vote which never went to print. 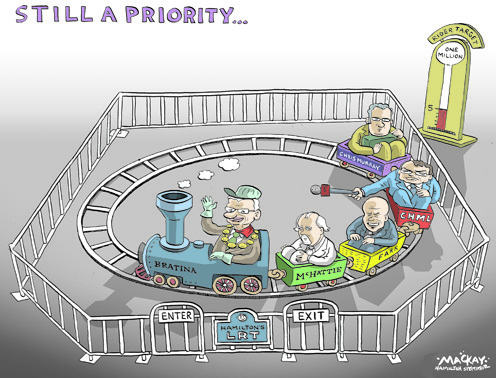 The one which ran above, dubbed “happy Fred”, was the more celebratory version for Mayor Eisenberger – it was also the last cartoon I created, thinking it was the least likely cartoon to be used. The version I put most effort into was “sad Fred”, showing him asleep at the levers as his train glided off a cliff. If the numbers had been tighter between the Mayor and his main challenger Vito Sgro, I thought sad Fred would work best by reflecting his downplaying of LRT as a major issue in 2018. There was only one Sgro victory version, and as the first, and perhaps only depiction I ever draw of the man, it was the first cartoon I drew yesterday, showing him above the neck, and full-faced. Yesterday morning as people began casting ballots, Vito Sgro was viewed as a very possible candidate to topple Eisenberger and take Hamilton on a future course without LRT. While the project is by no means a for sure thing for this city, with several anti-LRT councillors returning or elected, it’ll take a Mayor with a mandate to champion it among council and the Doug Ford government. It has been more than 10 years since the offer of $1 billion was presented to Hamilton to upgrade its transit system, I think it’s time to get it moving once and for all. At least one robocall poll suggests a divisive LRT project has turned Hamilton’s mayoral election race into a statistical dead heat. An automated telephone survey by Forum Research of 1,556 residents showed 39 per cent support pro-LRT incumbent Fred Eisenberger while 38 percent back anti-LRT challenger Vito Sgro. Other respondents either said they will choose another of the 15 mayoral candidates (12%) or were undecided (12%). Respondents – a majority reached by landline – were similarly divided when asked how they felt about the contentious $1-billion light rail line, said Forum Research president Lorne Bozinoff. Half said they opposed the project, while 46% were supportive. And when those residents were specifically informed about the positions of both candidates on LRT and asked to choose between them again, the support split at 43 percent each. Forum Research was not paid for the survey and plans to release the results publicly Friday, said Bozinoff. The firm periodically conducts polls and offers the results for free to drum up clients. Bozinoff noted light rail transit was also an issue – but not the top priority – for voters polled in a paid Forum survey conducted for The Spectator during the 2014 election. This time, fully a third of respondents called LRT the top issue that would influence their vote. I don’t think I’m the only one to declare that this has got to be the quietest, and indeed, dullest municipal election Hamilton’s had in a long time. As ground is supposed to be broken for a billion dollar LRT system, politicians are waffling in their support, and advocates for & against are huddled in their echo chambers. Mayor Fred Eisenberger claims it’s not even the top issue of the 2018 campaign. With a new unpredictable government in charge at Queen’s Park saying do what you want with the $1B, which the previous gov’t said was only for LRT, there’s a lot of uncertainty about what is coming Hamilton’s way, despite having spent $100 million, and years talking about it. It’s as if people are done talking about it, on either side of the debate, and maybe an election is the wrong time to whip up voter attention, especially when only 35% of them will even bother to cast a ballot.